For all those who have played Monopoly at anytime in life there is one thing for certain, Boardwalk holds an allure that most players simply can not resist. Me and my former roommate would often play the game and on the first few trips around the board as players are snatching up everything they land on, it became apparent to me that I was getting cash poor quickly and so was she. There was no liquidity strategy for either of us. I decided to change my approach and the key to that approach was to not buy Park Place or Boardwalk unless I needed to defensively prevent her from obtaining a monopoly. Even if she had obtained one of the properties I may not buy the other depending on her cash position. A tip in Monopoly, keep your money under the table. The great sin of Monopoly and many beginner real estate investors is that they do not actually purview the reality of what they are starting with in relation to what they will potentially be buying during the game. Each Monopoly player starts with $1 500. Just a quick examination of why Boardwalk makes no sense for a period of time is that it cost $400 or almost 27 percent of your starting cash position. On each trip around the monopoly board there is a 2.5 percent chance you land on any one square. It would take your competition eight trips around the board before your property paid you back landing on it every single time just to get that money back. Now, let us say you get lucky and land Park Place as well, that is $750 or half your starting cash position to land the Ritz Carlton and Fifth Avenue equivalent. The problem is to get any true value out of them you need to develop them. To get them up to hotel level you first have to build four houses on each which are $200 a piece and then finally a hotel. You can not just build on one property in Monopoly. So if you put one on Boardwalk, then you have to put one on Park Place next. 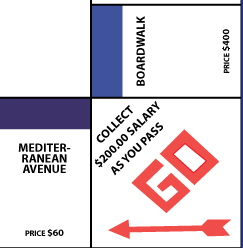 To get both properties up to hotel level it cost $2 000 or 10 trips around the board. In exchange, both properties now give you a 5 percent chance of landing rental income of $3 500. On the flip side, if you were to buy all five “cheap” properties of Mediterranean, Baltic, Oriental, Vermont, and Connecticut and develop them up to hotel level it would cost you $1 690 and give you a 12.5 percent chance for $2 400 in rental income. Again, think about where you are starting. In comparison, you gave up half your cash position to acquire Park Place and Boardwalk, and then need to circle the board at least seven more times to get to hotel level. Whereas for MBOVC properties, you can acquire and build all of them with your starting cash and one trip around the board. By the PPB owner’s sixth trip, you have had the potential of generating $14 400 in rental income at over twice the opportunity that they have, and in the process they will be potentially cash strapped. You on the other hand, just on passing go six times will have accumulated $1 200 in income, not including potential rental gains. So how does this play out in the real world? Many start up real estate investors are just not honest with themselves. They want to buy properties that endanger their cash position and not add to it. There are really two types of investment properties in real estate regardless of whether it is commercial or residential; they are cash flow or appreciation. Cash flow properties tend to be the MBOVC properties. They offer little in the way of appreciation, but kick off enormous amounts of cash. On the flip side, PPB are appreciation properties, meaning the cash flow on them will be tight (maybe negative), but over the long-term the property will rise appreciably in value. The problem with the latter for start up real estate investors is that nothing can go wrong. Razor thin margins (if any) means that maintenance and repairs are all coming out of your pocket instead of the properties revenues. In a cash flow property you are looking to keep it standing and functional as opposed to a Miss Universe competition. As such, even basic repairs and maintenance can be kept up with the revenues of the property because of the acute profit margins. So what are MBOVC properties? It is all relative to your own starting cash position. Things you should keep in mind are how much is your current income, financing options, down payments, estimated repairs and ongoing maintenance, and taxes. In essence, these are properties that will not strain your cash position and have high profit margins. If you can purchase and repair the property and still have a 100 percent profit margin, then that is the bulls eye. Often these are properties that have Section 8 potential or Class D multifamily properties. The latter are usually in low-income and working class areas where tenants have higher eviction rates, more likely to pay rent in cash/money order, and where maintaining a quality standard of the property will not be costly. Given the rise of renters in the United States with credit still very tight for potential home buyers’, there is a sweet spot available for investors who can offer affordable housing, especially among millennials saddled with student loan debt. Les Christie of CNN Money reports, “The median rent for all types of rental homes hit $1,350 a month in March (2014), up from a median of $1,285 a month 12 months ago, Trulia reported.” You may have to search smaller towns with growing demographics or areas of the big city that are hidden gems, but still offer an affordable purchase option. Thinking outside of the box of where you purchase your rental properties is key. It may be in a small town in Arkansas, but wherever it is be sure you do your homework and not be afraid to take on a project. Cash is king, as my entrepreneurship teacher Charles Reed would always say and without it you are out of oxygen in business. 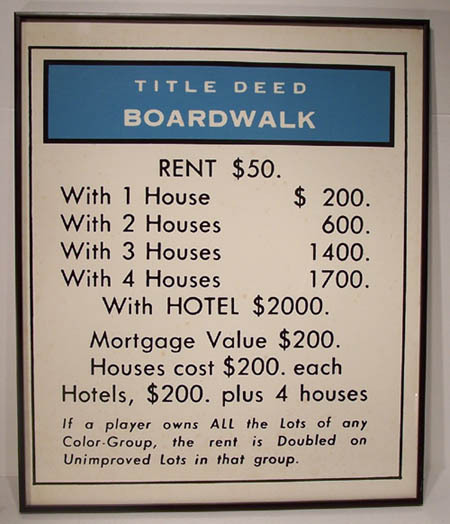 In Monopoly, I would often buy the red, yellow, and green properties, but would not build on them unless someone landed on my MBOVC properties. This allowed me to grow and keep my cash position sound in case I had landed on someone else’s property. These lessons are the same I am applying to my rental property portfolio. 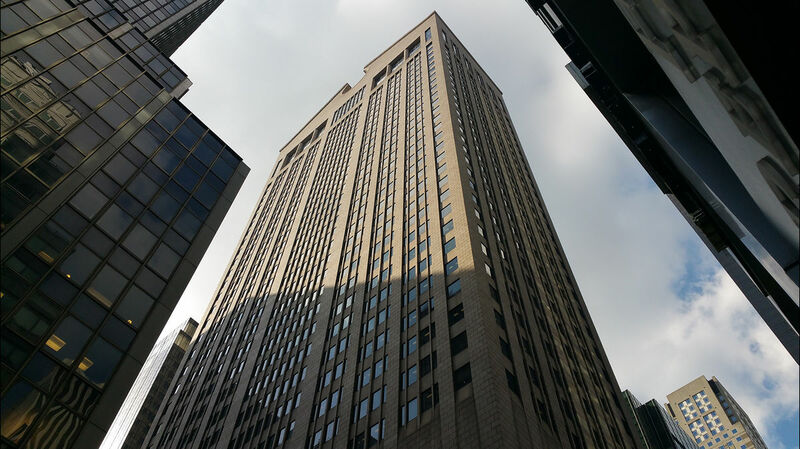 Maybe one day I will own or build a Boardwalk property like the NYC Sony Building (pictured above) where a triplex in the building is on the market for a record $150 million and probably would fetch easily $800 000 to $1 million per month in rental income. Monopoly, it is just a game, but take heed to its lessons and you may just win in real life. This entry was posted in Real Estate and tagged investing, monopoly, passive income, real estate. Bookmark the permalink.